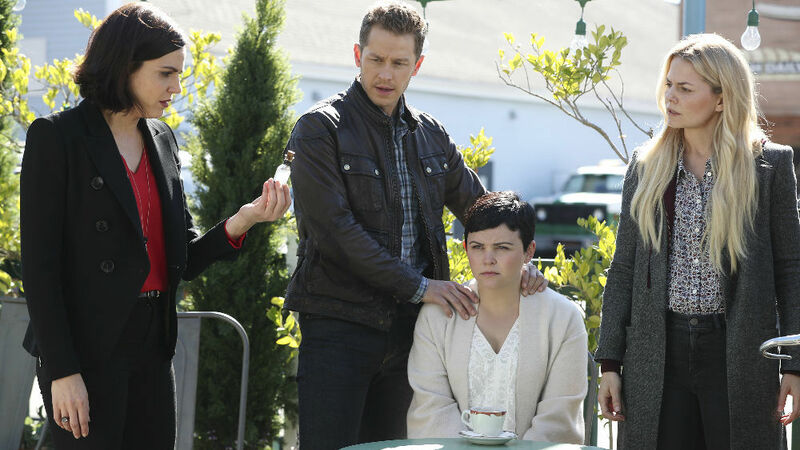 One would think that after five seasons of heartache, Snow and Charming would be able to live in peace and harmony. But when the Evil Queen is involved, that certainly isn’t going to happen. On tonight’s Once Upon a Time, the Evil Queen finally got her revenge on the couple she loathes the most, and it is beyond brutal. At the end of last week’s episode, she vowed to get Snow’s heart once and for all with help from Rumple. So, the Evil Queen approached Snow and told her that if she and Charming didn’t hand over their hearts willingly (remember, Charming has half of Snow’s heart, so she wants both halves) within 12 hours, then she would release some type of dark potion on the town. The potion turned out to be water from the Underworld’s River of Lost Souls, which basically kills anything it touches. Yeah, Snowing found themselves in quite the predicament. Either they hand over their hearts, or Storybrooke and its residents die. At first, they thought they discovered a way to fight her. Blue said that if they found a young, incredibly rare sapling created from the first spark of true love (by the way, we learned it was created by Snowing’s first touch of their hands), they may be able to use it to trap the Evil Queen. Let’s just say, they found it, but not before the Evil Queen showed up and destroyed it. There went that plan. In the end, Snow and Charming realized what they needed to do. They would hand over their hearts because, no matter what, their love is more powerful than anything the Evil Queen throws their way. Like the good people they are, the two would never let an entire town sacrifice themselves. Once the Evil Queen took their hearts, she declared that she would not kill either of them but do something far worse instead. She wanted to give them her pain of being alone. So, she gave them their hearts back but, of course, there was a catch. Snow fell asleep and entered another sleeping curse. But that wasn’t all, because the Evil Queen also made her body disappear and told Charming good luck in finding her. The good news? Charming ended up finding Snow in the woods and kissed her, and she awoke. The bad news? Charming then fell into a sleeping curse. That’s right, Snowing fans: The Evil Queen placed Snow’s heart under a sleeping curse, which means that when Snow is awake, Charming is asleep, and vice versa. At this point in time, they will never be awake at the same time. How heartbreaking is that? The Evil Queen is ruthless, and this curse shows it more than ever. Here’s hoping the heroic people of Storybrooke figure out a way to lift this curse, or Snowing may never be together ever again.